Valve has revealed the next two classes to be given the action figure treatment after the Pyro and the Demoman. The Soldier and the Heavy will be the next two classes in Valve's popular war-themed hat simulator Team Fortress 2 to be given the action figure treatment. They will join the Pyro and the Demoman when they go on sale in the Valve store sometime in July. The Pyro and Demoman are currently sold out on Valve's official store, but enterprising users can find them online at stores such as Amazon. "We want TF2 toys," came the overwhelming cry from TF2 fans who weren't content with throwing money at digital hats. "We will make TF2 toys," said Valve, announcing a series of gorgeous, intricately detailed TF2 models by gaming heads. "We want less expensive TF2 toys!" replied the fans, on seeing the $250 price tags on the gaming heads models. Valve, who only aims to please, then went on to announce a line of cheaper Team Fortress 2 "action figures," from prominent action figure company NECA. At just $21 and coming bundled with a code for a free hat in the game, who could have been disappointed with the Demoman and Pyro action figures? People who are fans of the other classes, of course! But that is soon to change. 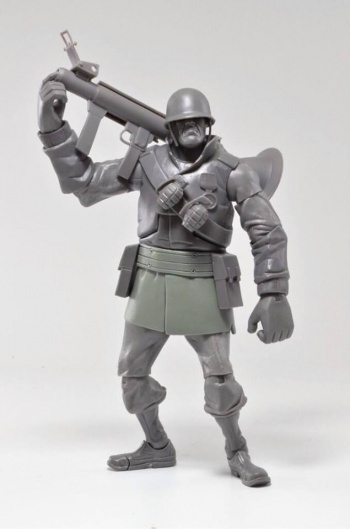 You can see the prototype of the Soldier action figure to the right (obviously, he will be painted red when he's finished), and NECA previously released some work-in-progress shots of the Engineer and the Spy, which we can probably assume will be the next two figures after the Soldier and the Heavy. Valve previously released a baloonicorn plushie, along with a free in-game asset, on its store.